For US citizens, a demonstration of how to apply online for your U.S. passport. Did Texas Sen. Ted Cruz diss dual citizens? Posted in Latest News	| Tagged ..., Latest, News, North Fort Myers, Passport', Renew, Ted Cruz, U.S. Yes, Passports Do Need to Be Renewed! 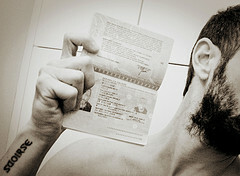 Now-a-days, many more people have taken the time and trouble to apply for a passport, even if they don’t travel much. Passports can be used for any type of identification, and even traveling within the United States with a passport makes it quick and easy to pass through the security checkpoint at airports. Most people who have a passport tend to put them away somewhere until they need it, only to be unpleasantly surprised to find their passport has either expired or will do so by the time they leave on their overseas vacation. Adult passports are good for 10 years, and children every five. Since the processing time can be delayed for any number of reasons, renewing a passport within a year of expiration is a good idea. There is a bit of paperwork and, of course, a fee, but the process is much easier than a first-time application. Except in certain situations, most passports can be renewed by mail. This saves you the time of having to locate a passport agency and stand in line to have your signature witnessed. Every government agency needs its paperwork, and passport renewal is no exception. You’ll need to complete the form DS-82, “Application for a U.S. Passport by Mail”, which can be found online or at most post offices. Always print carefully and use black ink. Don’t forget to sign it! If you’ve changed your name, such as a marriage or divorce, you’ll need to include a certified original of any supporting documentation. Since you’ll need to send your current passport along with your application, it’s always a good idea to make a photocopy. In fact, photocopy your renewed passport when you receive it, as replacing a lost or stolen passport is easier if a copy is available. The fee for renewing a passport is $ 75.00. Make the check payable to the U.S. Department of State and include it along with the other paperwork. When you’re ready to mail everything, plan for the worst by using a traceable means of mailing such as certified mail. Also, mail can and does get damaged in transit, so pick a durable mailing envelope such as the “Tyvek” type, which are water resistant and strong. Renewed passports typically take 3 to 4 weeks from the time of receipt, but times could be longer if there’s a backlog or anything is wrong with your paperwork. Expedited service is available for those in a hurry. Check the website for the U.S. Department of State for important details. Once you’ve received your renewed passport, you can tuck it away for another 10 years or until you’re ready for your next trip. Posted in Articles	| Tagged easier, Need, Passports, process, Renewed, State, U.S.